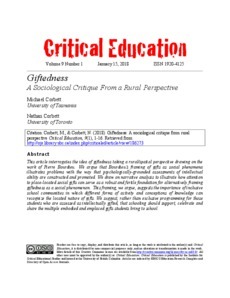 This article interrogates the idea of giftedness taking a rural/spatial perspective drawing on the work of Pierre Bourdieu. We argue that Bourdieu's framing of gifts as social phenomena illustrates problems with the way that psychologically-grounded assessments of intellectual ability are constructed and promoted. We draw on narrative analysis to illustrate how attention to place-located social gifts can serve as a more robust and fertile foundation for framing giftedness as a social phenomenon. This framing, we argue, suggests the importance of inclusive school communities in which different forms of activity and conceptions of knowledge can recognize the located nature of gifts. We suggest, rather than exclusive programming for those students who are assessed as intellectually gifted, that schooling should support, celebrate and share the multiple gifts students bring to school.